So I'm no stranger to classic literature, but last year I started reading Middlemarch by George Eliot and boy has it taken me a long time to finish! To be more precise, I started reading it on April 29th 2014 and I finished it last Saturday. I'm not sure what it was about the book that made it take me so long; sure, the language was from a different era, and I do think some of Eliot's best quips may have sadly been lost on me, but I don't think it was a matter of it being too hard. In fact, the more of the book I read, the more I liked it! The book is written in eight 'books', reflecting the serialised publication of it in the mid 1800s when it first came out. The author, George Eliot, aka Mary Anne Evans, would become one of the most well known authors of the time, but during her own lifetime, she published under a male pseudonym. Middlemarch is a novel about a provincial town in the English countryside where several relationships play out. There is Dorothea Brooke, a young woman of nineteen who wants to make something of herself, and sees her marriage to a stuffy academic many years older than herself as the path to greatness; Tertius Lydgate a young doctor whose modern methods make him the best doctor but not the most socially accepted, who finds himself engaged in a flirtation with the town beauty, Rosamund Vincy; and Rosamund's brother Fred, a gambler and a spendthrift, who wants to convince his childhood friend, Mary, that he is worthy of her hand in marriage. Throughout the books, the fortunes of these characters rise and fall. There is a little something for everyone. 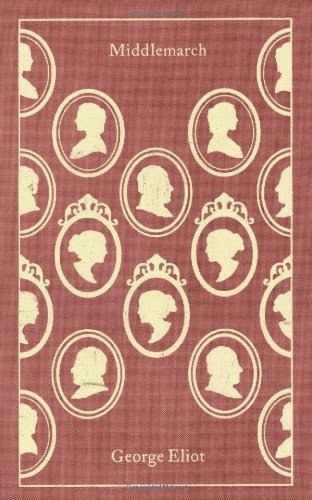 Eliot is a witty and observant writer, whose narration inserts itself in and out of the story to make remarks, such as, when describing Rosamund's education she makes a quip about the school educating its ladies in all important matters, even down to the little things like getting in and out of carriages. Her characters were lifelike but also comical, and well-drawn, although there were such a lot of them that sometimes it was very hard to keep track of the minor ones. My favourite part of the book was the love triangle that was set up between Dorothea, her husband Mr Causabon and his nephew, Will Ladislaw, a young man more suited to Dorothea whom she comes to love only after she realises that her marriage is not going to the be the intellectual partnership she longs for. Mr Causabon does not live long into the novel, and perhaps this is a blessing for Dorothea, except for a codicil in his will which prevents her from marrying Will Ladislaw on the penalty of losing her home and her inheritance from her husband. For Dorothea, this is also a matter of propriety and honour, for the codicil means that her marrying Ladislaw would make her a traitor to her word, and she spends much of the novel feeling both drawn to and repulsed by Will. It is only when she thinks he may not adore her as purely as she has always thought he did that she admits to herself that she loved him, and is heartbroken. 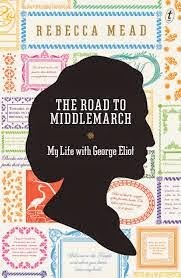 This is a novel which I will one day re read, particularly after having read Rebecca Mead's bibliomemoir, The Road to Middlemarch, in which Mead thematically discusses the novel, her own life, and the life of George Eliot according to the stages of life represented by each stage in the novel. While this is an interesting approach, it is not chronological, which was confusing, but her light, conversational style made the life of a very serious woman interesting, and she managed to illuminated my complicated impressions of the weighty novel that is Middlemarch.